In California, the deadline to register to vote for any election is 15 days before Election Day, so please register early! 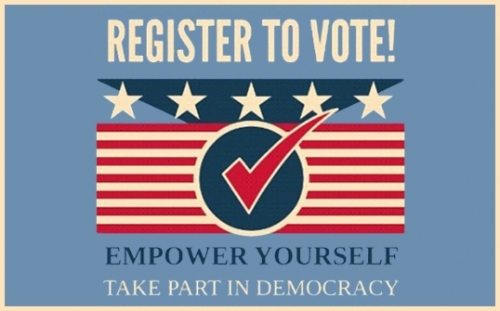 Voter Registration Deadline for Election on November 6, 2018. Your registration must be postmarked or submitted electronically no later than: October 22, 2018. You can apply to register to vote right now by filling in the online application. The application is available in English, Spanish, Chinese, Hindi, Japanese, Khmer, Korean, Tagalog, Thai, and Vietnamese. If you have any questions, visit Frequently Asked Questions or contact the Secretary of State's Elections Division at (800) 345-VOTE (8683) or by email. If you are enrolled in California's confidential address program, Safe At Home, please do not apply to register to vote using this site. Contact the Safe At Home program toll-free at (877) 322-5227 or by the Safe At Home email. A United States citizen and a resident of California (for information on voters in the military or overseas, please see Military and Overseas Voters), 18 years old or older on Election Day, Not currently in state or federal prison or on parole for the conviction of a felony (for more information, please see Voting Rights: Persons with a Criminal History), and Not currently found mentally incompetent to vote by a court (for more information, please see Voting Rights: Persons Subject to Conservatorship). Be 16 or 17 years old, and Meet all of the other eligibility requirements to vote. If you would like to register using a paper voter registration application, you can pick one up at your county elections office, library, Department of Motor Vehicles offices, or U.S. post office. It is important that your voter registration application be filled out completely and be postmarked or hand-delivered to your county elections office at least 15 days before the election. To request a paper voter registration application be mailed to you, please call (800) 345-VOTE(8683) or email Elections Division staff. In elections conducted by your county elections official, you can “conditionally” register and vote at your county elections office after the 15-day voter registration deadline. For more information please go to Conditional Voter Registration. If you are a Californian living away from home while attending a college, trade school or technical school, or a voter living temporarily outside the United States, please see College Students and Voters Living Abroad. Are You Already Registered to Vote? To find out if you are currently registered to vote, visit Check Status of Your Voter Registration. You change your name, or You change your political party choice. As a California voter, be aware that local elections in some areas are held on dates that do not coincide with statewide election dates. The 15-day close of registration deadline for these local elections varies depending on the actual date of the election. If you need to know a deadline for a local election, contact your county elections office or visit County Administered Elections. If you are currently registered to vote in California and would like to cancel your voter registration, you can complete the California Voter Registration Cancellation Request Form (PDF) and submit it to your county elections office. If you have any questions, you can contact your county elections office or the Secretary of State's Voter Hotline at (800) 345-VOTE (8683). Anyone distributing voter registration cards in California should be familiar with the rules and regulations for conducting voter registration drives. The Secretary of State is responsible for producing a statistical report detailing voter registration numbers in California. To view these reports, please go to Voter Registration Statistics. The law prohibits your voter registration information from being used for commercial purposes. Report any problems to the Secretary of State's Voter Hotline at (800) 345-VOTE (8683). For additional information regarding your voting rights, please go to Voter Bill of Rights.